The I.G.S. K-9 division is headed by Yona Mendel who was a handler and team leader of an Israeli commando unit and has provided K-9 training to military, police and private sector clients worldwide. 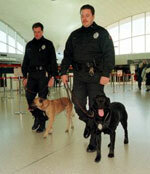 We have the right dogs and handlers to meet your security needs. Our fully trained dogs are able to work independently or in a team situation with their handler. You can purchase a complete package which includes a dog trained to meet your specific requirements, a trained handler or training for a handler you choose as well as periodic follow ups. We will provide a dog and handler team that will provide the services you need based on a pre-determined schedule. Our K-9 services can take place in a wide variety of locations, including: airports, train and bus stations, warehouses, open areas, public places, offices, vehicles, parking lots, industrial parks, hydroelectric installations and petroleum sites.